We have seen what are quartiles and how can be useful in quickly presenting the main characteristics of a group of data. Let’s see how to visualise them. 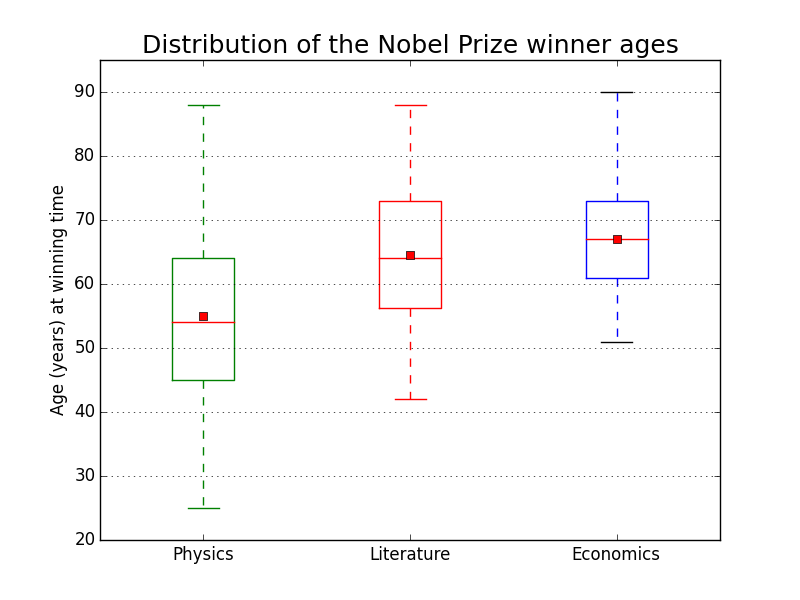 I will use as example the age of the Nobel Prize winners – a discrete values set – from the Nobel Prize official site. You can follow along with the code on GitHub. 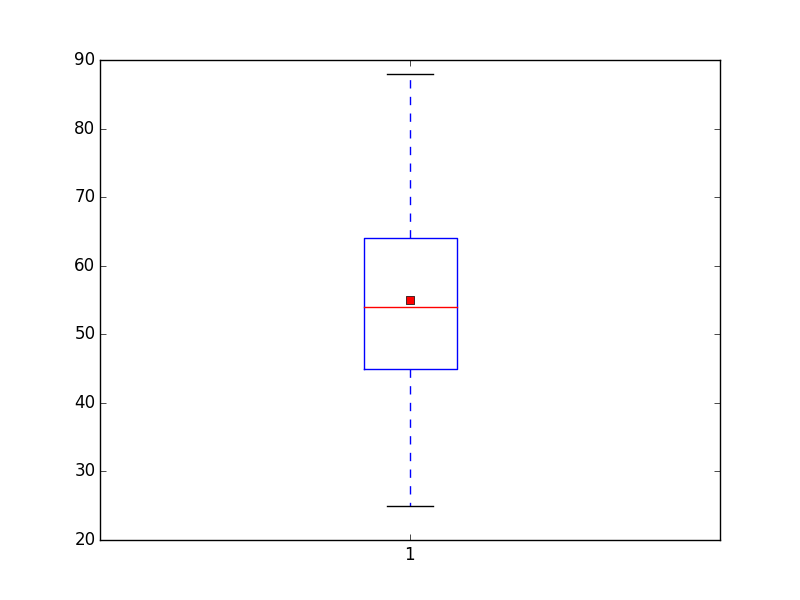 a box that goes from the upper to the lower quartile, plus optionally lines (the whiskers) extending from the box that go until a specified multiplier of the Inter-Quartile Range (IQR = upper – lower quartiles), while any other point outside this range is considered an outlier data point and displayed as a point. Inside the box the median and the mean can be displayed, as lines or points. As you see the box itself goes from the upper to the lower quartile (45 and 64 in this case), while the whiskers (the bars extending from the box) go from the minimum to the maximum (25 and 88 in this case) because whis is set to a very high number (99) therefore including all the data points. The red line is the median (54) while the mean (similar value) is a red square but can be changed through the parameter meanprops. We have seen how to calculate measures of central tendency as mode and mean, and deviation measures such as the variance. Let’s see another measure describing how the data is distributed: the quartiles. The quartiles of a set of data values are the three points that divide the ranked data set (i.e. you need to order the data points first) into four equal groups, each group comprising a quarter of the data. 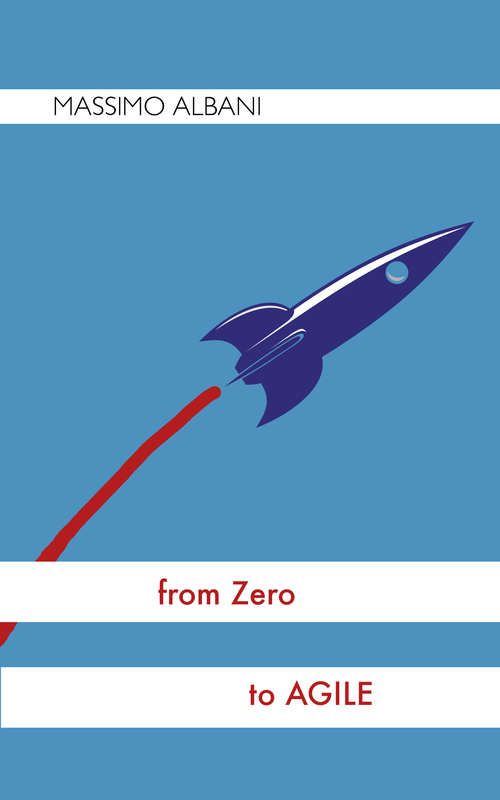 Quartiles are actually a type of quantiles which are values taken at regular intervals; another popular type of quantiles are the percentiles – where you divide the data sets into 100 groups – like in “a student scoring above the 80th percentile of a standardised test”. Let’s see how to calculate them with Python.